Are you interested in making more effective graphics in R? Check out the code template, practice data, and presentation on my github to learn more about R packages and techniques to make manuscript-quality maps and associated graphs that highlight important statistical and spatial relationships in your data. ​We had an extremely successful session at the Northwest Science Association Meeting in March 2018 in Olympia Washington! We discussed important connections between native food plants, people, animals, and ecosystems – and how climate change may alter those connections in the future. Check out the preliminary results for our work looking at how climate change may impact the range and timing of flowering and fruiting of black huckleberry here. The list of all talks and abstracts for the session (and the entire meeting) can be found here. 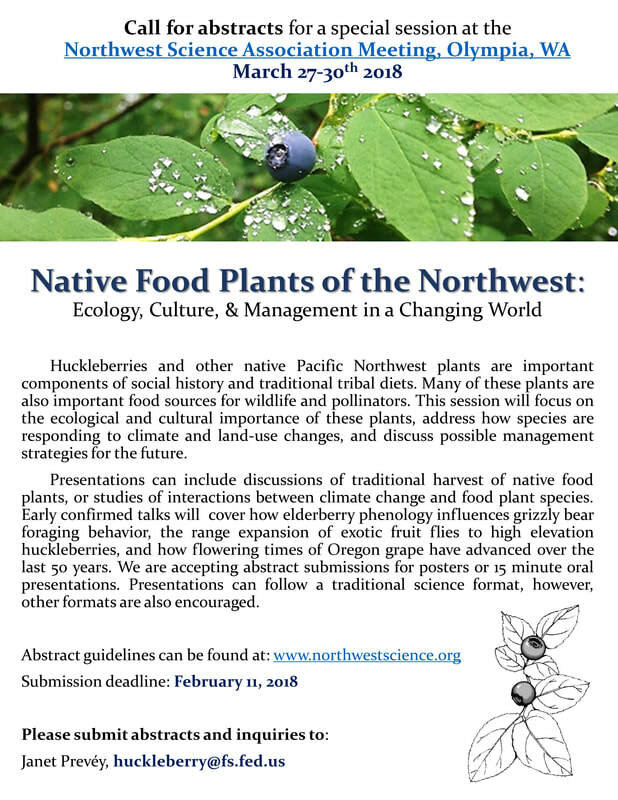 We are hosting another session on First Foods at NWSA in Lewiston, Idaho, March 25-29 2019 - Join us!